Sometimes, even the humblest of puppets can be among the most effective voices of strength during the worst of times. For Philippine puppeteer, Amihan Bonifacio-Ramolete, puppetry was her tool for helping her country rebuild and recover after the disastrous typhoon hit her country in 2013. She’ll tell audiences how in her talk, Promoting Resilience through Puppetry: The Typhoon Haiyan (Philippine) Experience, at the Puppet Power Conference in June. Amihan will talk about her experience working with Teatrong Mulat ng Pilipinas (MULAT) after Typhoon Haiyan (Yolanda) devastated the Visayan region of The Philippines. Through puppetry, MULAT conducted workshops for daycare workers to build their capacity to work with children in a post-disaster context and emphasized that puppetry can serve as a communication tool for rebuilding the community and recovery from great loss. Training daycare workers in puppetry gave them an alternative medium for creative expression as well as a tool for teaching children. Amihan showed that puppetry could also be used as a psychosocial tool or therapy by daycare workers to relieve children from stress and trauma brought about by tensions, disaster, catastrophe or violence. Amihan is the company manager and senior puppeteer of Teatrong Mulat ng Pilipinas, artistic consultant of the Usbong Papet Baclayon in Bohol, and the Philippine representative to Union Internationale dela Marionnette (an international organization for puppet artists). She has bachelor’s, master’s and PhD degrees in Psychology and a master’s degree in Theatre Arts from Unibersidad ng Pilipinas. She is an Associate Professor who handles undergraduate and graduate speech communication and theatre classes and is currently the Dean of the College of Arts and Letters. Click to learn more about Amihan and her talk. 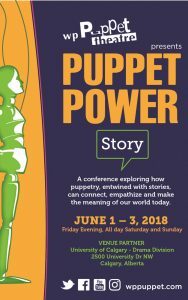 Puppet Power 2018: Story is a Conference on Applied Puppetry, June 1-3, 2018, in Calgary, AB, Canada. 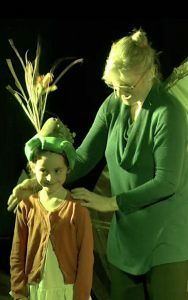 Explore the transformative power that puppetry has to tell stories, inspire dialogue and make meaning of our world today. Learn, play, and galvanize with hands-on workshops, talks, panels, and more! Find out more about the conference or register at the early bird rate until March 31st!